The Senate discussed the temporary removal of senators from meetings and Bylaws changes. Vice President Aaron Finkel ’20 swore in the semester’s newest members, while Class of 2022 Senator Alex Chang resigned his office in the last minutes of Sunday’s senate meeting. Finkel began Sunday’s meeting by swearing in the newest members of the Senate: Senator for Off-Campus Students Jacob Diaz ’20, Senator for East Quad Taylor Fu ’21 and Class of 2020 Senator Thomas Alger. Following the disbanding of Project Plus One NGO, the Project Plus One club partnered with the non-governmental organization Partners in Health and their “grassroots program” PIH Engage. 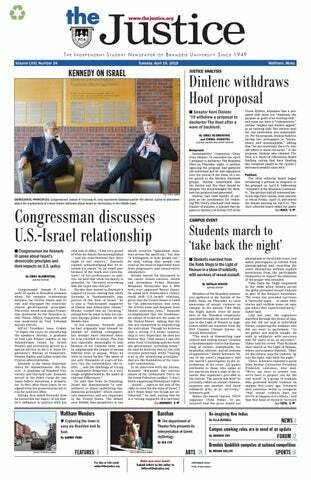 The senate voted on a proposal to change the name of Project Plus One to Partners in Health Engage Brandeis. The name change was approved by a unanimous vote of acclamation. The first matter of unfinished business was resolving a proposed Bylaws amendment presented to the Senate by Rules Committee Chair Jake Rong’s ’21 last week. The amendment would eliminate a clause from the second section of Article II of the Bylaws requiring senators to deliver “weekly project reports.” Rong said the procedure is archaic and no longer needed, because the weekly Senate meetings already have senator reports and committee chair reports for this purpose. The Senate passed the motion by acclamation. Finkel clarified that removal from Senate meetings cannot last for more than two meetings at a time, but that a two-thirds vote would be required to allow a removed senator back into Senate meetings. Responding to a question from Rosenthal and Skyline Quad Senator Josh Hoffman ’21, Finkel said the meetings that a removed senator would miss would not count as unexcused absences. The Code of Conduct would apply to all branches of the Student Union, not just the Senate. The motion passed unanimously by a vote of acclamation. Ziv and Ridgewood Quad senator Leigh Salomon ’19 and Rong presented a Bylaws amendment to change the voting procedure. The proposed amendment would require motions being voted upon to undergo no more than one round of voting, and to only allow senators to cast one vote. Rong and Leigh partnered on the amendment after several meetings last semester where a vote was tied, and senators changed their votes. Without a rule in place limiting the number of rounds of votes, the Salomon and Rong argued, senators’ ability to vote independently is hindered. Massell Quad Senator Kendall Chapman ’22 objected to a motion to suspend the rules to vote on the amendment, saying she didn’t feel she fully understand it. The Senate agreed to postpone the vote until next meeting. Class of 2022 senator Alex Chang dashed into the Senate meeting minutes before it adjourned to announce his resignation. Citing the Senate’s mistreatment of International Student Senator Linfei Yang ’20, Chang said he was disappointed in the Senate’s handling of the matter and felt he could no longer serve as a senator when he felt “unwelcome” at Senate meetings. “We’re both freshman senators, and I really looked forward to working with you, I know that you feel like in a lot of situations you were treated unfairly or that things didn’t go the way that you wanted it to, and I extend my sympathies to you because I think you did face a lot of unfair treatment. But there’s a difference between rising above it, and wallowing in it, and listening to other people tell you what went wrong. —Editor's Note: This article originally incorrectly said that voting on an amendment would be postponed until next semester. It was corrected to say that it was postponed until next meeting.